Tamil Canadians are Canadians of Tamil ethnic origins mostly from Sri Lanka. From a population of fewer than 150 Tamils in 1983, it has become one of the largest visible minority population groups within the Greater Toronto Area. In the 1991 census, Tamils were the fastest-growing ethnic group in the city. 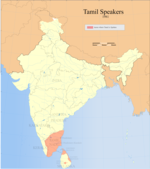 Canada's Tamil population is thought to constitute the 2nd largest Sri Lankan diaspora in the world (London having the largest congregation of Tamils) with Toronto (having a Tamil ethnic population of 157,000 as of 2016) being home to the 2nd largest Tamil community outside of Asia. With the outbreak of riots and eventual civil war in Sri Lanka in 1983, Tamil migration to Canada increased significantly. In 2000, Sri Lanka was the sixth largest source country of immigrants to Canada, sending 5,841 people or 2.57% of Canada's immigrant total. Between 1991 and 2001, Sri Lanka was the fifth largest source country of immigrants to Canada, after China, India, the Philippines, and Hong Kong. Between 2001 and 2010 Sri Lanka's rank dropped to 17 in the list of immigrant source countries to Canada. Well behind the major source countries China (327,317), India (277,819) and Philippines (191,121). In 2010 immigrants from Sri Lanka consisted of only 1.4% of Canada's immigrant total of 280,681. Most permanent residents from Sri Lanka came as either independent immigrants, refugees, or family class sponsored immigrants. Refugee claimants are an independent category of Tamils from Sri Lanka who arrived in Canada and are claiming protection under the Immigration and Refugee Protection Act. After 2001 there have been no Government of Canada or private sponsored Tamil refugees to Canada. There are 141,074 UNHCR recognized Tamil refugees in non-signatory countries. There are a total of 589,639 refugees from Sri Lanka in 2011 who have registered with the UNHCR in non-signatory countries. Much of the Tamil language media in Canada is based in Toronto, while some centres operate in Montreal. A community magazine, Thamizhar Mathiyil (Amidst Tamils), has been published since 1990 and has grown to several hundred pages in length. Ten alternative weekly Tamil language newspapers are distributed primarily in Toronto and Montreal. The Monsoon Journal and the Tamil Mirror are English language newspapers created and targeted at Tamils. Four Tamil language radio stations broadcast out of Toronto and Montreal as well. Three Tamil language television stations (Tamil Vision International, Tamil One, and Tamil Entertainment Television) are based in Toronto. Various political, social and religious organizations exists among the Tamil Canadian community. One such organization is Canadian Tamil Congress, which works as a community and lobby group to communicate on behalf of some Tamil Canadians at the municipal, provincial, federal, and international levels. [citation needed] The Canadian Tamil Congress is largest of these organizations with 11 chapters in the country. [citation needed] The smaller organizations are geared towards organizing kin and village groups from Sri Lanka, as well as supporting various political parties such as the Liberal Party of Canada, New Democratic Party and Conservative Party of Canada. Tamil candidates have participated in the political process representing various parties at municipal, provincial and federal level. In 2011, Rathika Sitsabaiesan was elected as the first Tamil-Canadian Member of Parliament, as a New Democrat in Scarborough-Rouge River. Previously, Logan Kanapathi was the first Tamil Canadian candidate to win election to large municipal government. He currently serves his second term as Ward 7 councilor in the town of Markham. Many Hindu Temples have been built by the community to cater to its religious needs. Hindu Youth Network, an organization founded by Sri Lankan Tamils, is currently the largest Hindu youth movement in Canada with thousands of Hindu Tamil students and over 80% of the Hindu student groups in the country under its umbrella. There are also Christian churches that cater particularly to the Tamil community in Canada. Tamil Canadians have run multiple campaigns encouraging the donation of blood to the Canadian Blood Services organized by various Canadian Tamil organizations. [citation needed] The community also undertook a recent campaign to help SickKids Hospital, which treats 100,000 children every year. These campaigns were organized by the Canadian Tamil Congress, with the support of many social and community organizations. [citation needed] Some campaigns and non-profit charities in the Canadian Tamil community have also been linked to the funding of the LTTE, a designated terrorist organization in Canada. A unanimous decision was made at the House of Commons on October 5, 2016 declaring the month of January as Tamil Heritage Month under M-24. The motion will "recognize the contributions that Tamil-Canadians have made to Canadian society, the richness of the Tamil language and culture, and the importance of educating and reflecting upon Tamil heritage for future generations by declaring January, every year, Tamil Heritage Month.". Canada has attracted a number of internationally renowned writers from Sri Lanka, including Shyam Selvadurai. Despite his family's relative privilege and urban base, his family left Sri Lanka because of the 1983 riots. Canadian Tamils have also contributed to the sports fields such as the formerly ranked Canadian tennis player Sonya Jeyaseelan and cricketer Sanjayan Thuraisingam. Pradeeban Peter-Paul a Tamil Canadian table tennis player has been part of the Canadian National Team for the past 12 years. He was one of two Canadians who qualified to represent Canada at the 2008 Summer Olympics in Beijing, China. Soccer and cricket are two of the main sports played by the Tamil population in Canada. A law named "Tamil Heritage Month Act, 2014" was passed by the Ontario government to proclaim January as Tamil heritage month. This law is for remembering, celebrating and educating future generations about the inspirational roles that Tamil Canadians have played. ^ > Cheran, R (2000). "Changing Formations: Tamil Nationalism and National Liberation in Sri Lanka and the Diaspora". Ph.D. dissertation. Department of Sociology, York University. ^ a b Jennifer Hyndman (2000). "Aid, conflict and migration: the Canada Sri Lanka connection" (PDF). Department of Geography, Simon Fraser University. Archived from the original (PDF) on 2007-09-27. Retrieved 2007-08-31. ^ a b Sriskandarajah, Dhananjayan (2005). "Diaspora politics". Springer US. Retrieved 2007-08-31. ^ "Immigration overview:Permanent and temporary residents". Archived from the original on 2012-08-19. Retrieved 2012-08-14. ^ "2012 UNHCR country operations profile - Sri Lanka". Retrieved 2012-08-14. ^ "Facts and Figures 2009". Cic.gc.ca. Retrieved 2010-08-15. ^ a b Cheran, R (2000). "Changing Formations: Tamil Nationalism and National Liberation in Sri Lanka and the Diaspora". Ph.D. dissertation. Department of Sociology, York University. ^ Lak, Daniel (2003-05-03). "Canada's Tamils dream of peace". BBC. Retrieved 2007-08-31. ^ "Tamil rebels 'coercing diaspora'". BBC. 2006-03-15. Retrieved 2007-08-31. ^ "globeandmail.com: National". The Globe and Mail. Toronto. Archived from the original on 2008-06-22. ^ "List of Hindu temples in Canada". Tamil library. 2002-05-14. Retrieved 2007-08-31. ^ "tamil heritage month - Canadian Tamil Congress". Canadiantamilcongress.ca. ^ "January is Officially Declared as Tamil Heritage Month in Canada". Tamilculture.com. ^ "கனடாவில் ஜனவரி இனி தமிழ் மரபு மாதம்: பாராளுமன்றத்தில் மசோதா நிறைவேறியது!". Tamil.oneindia.com. ^ "amil Heritage Month Act, 2014". E-laws.gov.on.ca. 24 July 2014. ^ "Census Canada 2016". Data products, 2016 Census. Statistics Canada. Retrieved 9 August 2018.